Over the years fans of this blog have asked if I would consider selling merchandise with the TaoSecurity logo. When I taught classes for TaoSecurity from 2005-2007 I designed T-shirts for my students and provided them as part of the registration package. This weekend I decided to exercise my creative side by uploading some designs to TeePublic. TeePublic offers clothing along with mugs, phone cases, notebooks, and other items. Two are based on the TaoSecurity logo. One includes the entire logo, along with the company motto of "The Way of Digital Security." 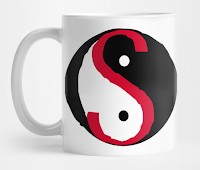 The second is a close-up of the TaoSecurity S, which is a modified yin-yang symbol. 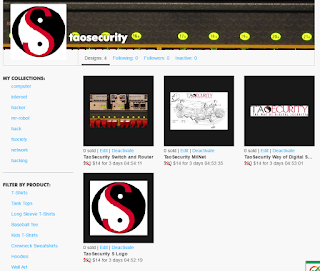 Two other designs are inspired by network security monitoring. One is a 1989-era map of MilNet, the United States' military network. This image is found in many places on the Internet, and I used it previously in my classes. The second is a close-up of a switch and router from the TaoSecurity labs. I used this equipment to create packet captures for teaching network security monitoring. I hope you like these designs. 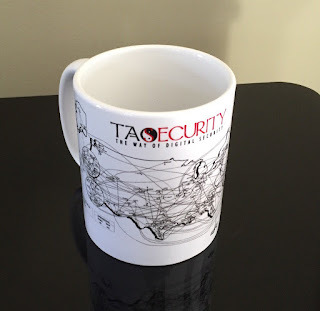 I am particularly partial to the TaoSecurity Logo mug, the TaoSecurity S Logo Mug, and TaoSecurity S Logo t-shirt. Let me know what you think via comments here. Check out the MilNet mug!